One of the most frequent questions we are asked when people find out we have seven kids is “how do you manage?” I will be honest for me it’s not that hard. Don’t get me wrong we have our bad days but for the most part we do all right. I know for a fact that I would be lost without my right hand man, literally James is one of the most competent and capable fathers I have ever known. He is amazing and completely hands on with our kids. Take right now for instance 3 weeks ago I went in for what we thought was a simple outpatient surgery for a torn meniscus on my right knee. 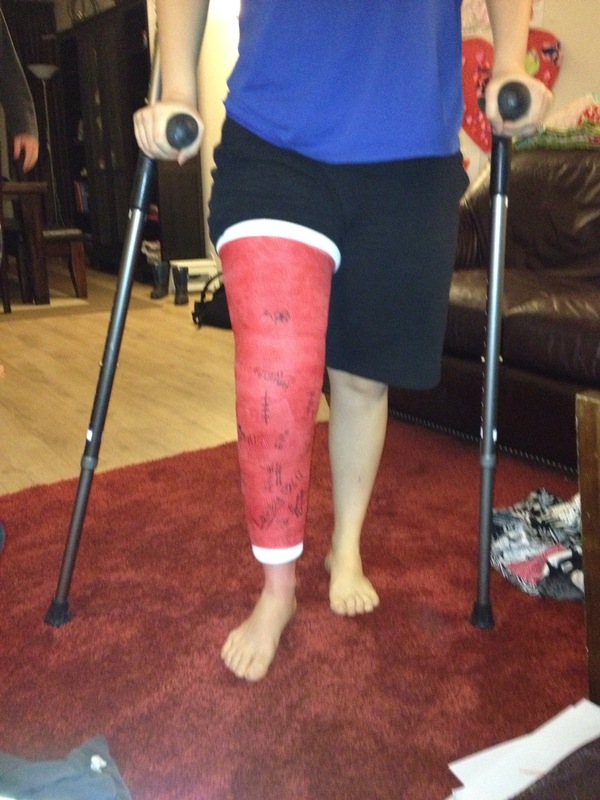 Only I woke up from anesthesia to find my right leg in a full cast from just below my hip all the way to the ankle. Panic started to set in as my doctor and nurses informed me the damage was worse than they thought so they ended up using reabsorbable pins to fuse my bones back together. Keep in mind this information is coming at me by people speaking Dutch and English at the same time all around me and I was sedated. It did not go over well. They wheel me into my recovery room and I find my sweet husband waiting for me after a 2 1/2 hour surgery instead of the 45 minutes we were prepared for and he gets the information and says “we’ll figure it out”. As if it is no big deal for a mom of 7 to be 100% non weight bearing for 6 weeks and then to do 6 more weeks of physical therapy. Fast forward 3 weeks and we are halfway through this ordeal tomorrow. I am not the most patient of people when it comes to laying low per the doctors orders. I hate doing nothing all day everyday. Don’t get me wrong I love my occasional lounge day where I stay in my pajamas and ignore all but the most basic needs of my children but enough is enough. How many Netflix and Hulu shows can one person watch? I feel like certain characters are my only friends these days and I wonder why they haven’t even called to check on me. I look forward to about 4:30 every afternoon because that is about the time people in the States are updating their statuses on Facebook. Every third day when I have the gusto to haul my 20 lb cast up the stairs and spend the 45 minutes it takes to shower I get so excited. Ignore the fact that I have to sit on a rented nursing home shower stool with a giant tube of plastic covering my cast so it won’t get wet. Saturday I was able to stand on one leg long enough to buzz the boys heads and cut James hair I thought I was fancy so tonight I stood one one leg again and gave 3 of the girls haircuts. I am almost positive they are even but if not just stand on one leg to look at them and you will be alright. My friends were awesome bringing in meals and taking kids where they needed to be for the first week till my mother in law flew in so that James can try to get as much work done as possible. She is here for 3 weeks and then my little sister in coming in to help for the rest of the time till the cast comes off. My husband is a smart man who understands what it takes to keep us running. He hired a cleaning lady who is AWESOME and may or may not stay on after I have healed, I am hoping we keep her then I wouldn’t have anything to do anymore except maybe laundry 😉 and then I can voluntarily lounge on the couch all day. This really cramped our vacation plans for February break. I was really hoping to escape from the winter weather but to quote my doctor ” any lady who has 7 kids is going to overdo it as soon as her cast comes off so I am telling you NO traveling” What does he know? So instead we will hang around here and maybe I will be let out of the compound for a day or two because of good behavior. So my advice to all you other moms out there who want some time off–find another way besides reconstructive knee surgery! Take a day or two off when you feel like it because it is not any fun when it is forced.